I’m hoping that a “normal” blog post will emerge soon, but in the meantime, here is a book review. It’s the school holidays, people! On a recent church weekend away, I took my two older children (aged 5 and 4) to a storytelling and book signing session in the “Book Café” (tent) with Alison Mitchell and Catalina Echeverri. It was actually the highlight of my weekend. The children were mesmerised as Catalina read the enchanting The One O’Clock Miracle. Not only is it beautifully written and illustrated, but it’s such a moving true story! 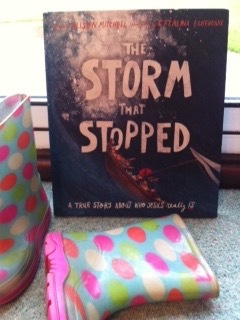 So I was excited to read ‘The Storm that Stopped’ to my children when it arrived in the post today. It didn’t disappoint. If these books are only teaching my children that Jesus’ words have mighty power, then thanks be to God! You can find the book here at the Good Book Co.
To read this AMAZING story in the Bible, check it out here – it will take 20 seconds (plus pondering time, which could be eternal).